On November 6, 1864, before the election of Abraham Lincoln to his second term, Wylie wrote, that the election was "perhaps the most important election that the country will ever see. Elect McClellan [Lincoln's Democratic opponent], all the deeds of the last 4 yrs are thrown away. -- The Rebels Conquer. -- And anarchy & disunion follow. . . Elect Lincoln. . .Rebs will be conquered, slavery exterminated, Union restored & a new era of unexampled prosperity commence." On April 6, 1865, Wylie wrote that "the whole nation was saddened" by the assasination of Abraham Lincoln. These two items, written toward the end of the Civil War, show Theophilus A. Wylie's political opinions. Like many Americans, Wylie supported Lincoln and worried that without his leadership the Civil War would end disastrously. Less than one year after Lincoln was elected to his second term, he was assasinated by John Wilkes Booth. Wylie expressed his sadness at this event, and his fears for the nation's future. Written by a friend of Theophilus Wylie in 1861, this letter mixed personal news with war news, and shows how the war affected the lives of people throughout the country. A letter from Charles Campbell, one of T. A. Wylie's students written in 1863, discussed news of the war and also reminsced about better times in Chemistry class. 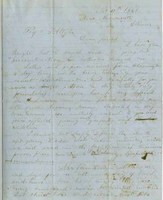 These two letters written to Theophilus Wylie exemplify how the Civil War affected people. Both discuss war news along with more personal stories about the ways in which life went on, despite the tumultous events happening between 1861 and 1863. One was authored by a friend of his and the other by one of his students. 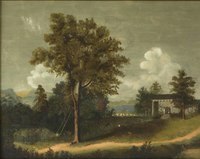 Richard Wylie painted this around 1854, when he was about thirteen; it demonstrates his talent as an artist. 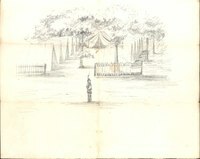 A drawing of an encampment during the Civil War which was likely done by Richard Wylie around 1861 when he was serving in the army. Theophilus Wylie wrote this letter to his son, Richard, and inquired about his wellfare and encouraged Richard to write back news. 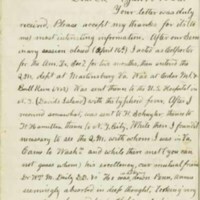 Theophilus Wylie also wrote to one of Richard's commanding officers, and discussed Richard's health which was not improving. Theophils Wylie's diary, dated Nov. 10, 1861, recorded the death of Richard. Roughly eighteen days later, on Nov. 28, 1861, Thanksgiving day, Theophilus reflected on giving thanks at a time when soliders like Richard were dying in the Civil War. On December 1 Theophilus Wylie received news that Richard Wylie's remains would be arriving, and on Decmber 8, Wylie recorded the funeral of his son with Prof. Ballantine presiding. In his diary entry for January 5, 1862, Theophilus Wylie wrote in Latin, "The Death of my Richard I still regret. God has done it. He has so afflicted us thus. It is not for us to blame the judge of the whole earth. Have mercy on us! My dear Jesus!" A fellow professor and member of the Wylie's Presbyterian church recorded an official act of the Prebyterian church to honor Richard Wylie's service to his country. 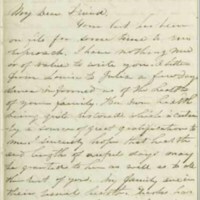 A friend of T. A. Wylie expressed sympathy for Richard's death in this letter written in November of 1861. Richard Dennis Wylie (1841 - 1861) was Theophilus A. Wylie's eldest son. He was not a very talented scholar, but showed great promise as an artist. He enrolled in the Union army with his friend Sam Dodds. Both died of disease before they could see combat. These items focus on T. A. Wylie's struggles with the death of his son, no doubt similar to many others whose children died or were killed in combat between 1861 and 1865. These items reflect a wide variety of perspectives on Richard's life and death. Two letters dating from Richard Wylie's time in the army show that Theophilus Wylie is concerned with Richard's physical and moral well-being. Theophilus Wylie encouraged his son to read his Bible and to avoid drinking alcohol. In his diaries, Theophilus Wylie mentioned Richard's death several times. One entry simply recorded the fact of his death. Another discussed the receipt of his body in Bloomington. Wylie also reflected on Richard's death several times. Once on Thanksgiving, and in January, a few months after his death, Wylie wrote a moving inscription in Latin (in caption at left) showing how much Richard's death affected him. Theophilus Wylie's friends showed great sympathy. James Woodburn, a member of Wylie's Presbyterian Church wrote to Wylie discussing the actions the church has taken to honor Richard. W. S. Stormont, a local farmer, responded to some earlier correspondence from Wylie because Stormont had heard about Richard's death. These items are only one example of a story that was repeated in many different ways for the young men who died during the Civil War. Understanding how Richard's death affected both the Wylie family and the larger Bloomington community can help to understand the complex ways that the war impacted both Indiana University and the state of Indiana more generally.